Food It Yourself Garden 2018- Can I Get a Volunteer? | Food It Yourself! Okay, so this will be three blog posts in a row dedicated to my garden, but I really think I am on my way to a personal best this year. It has been only ten days since I planted everything and I have sprouts and growth like I cold never have imagined. 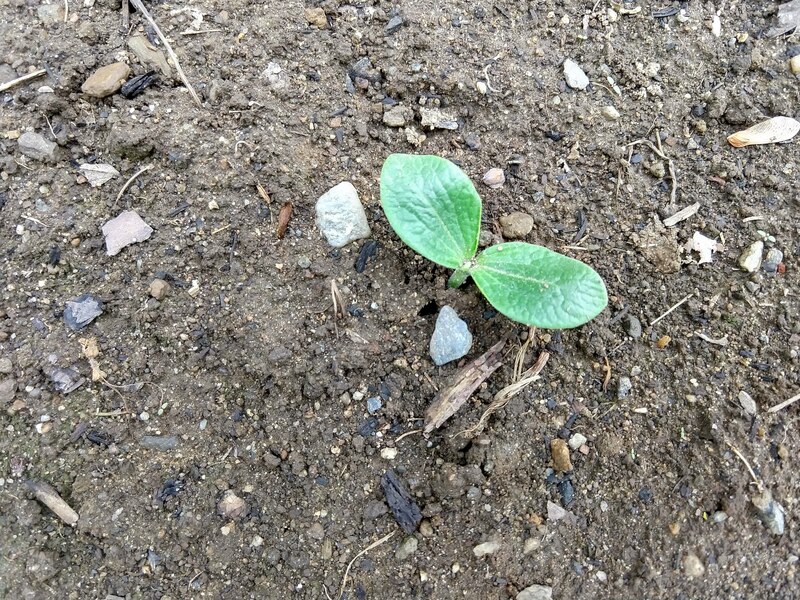 Zucchini is sprouting, but it is really hard NOT to grow zucchini. I was not sure this strawberry plant was alive. It absolutely is! 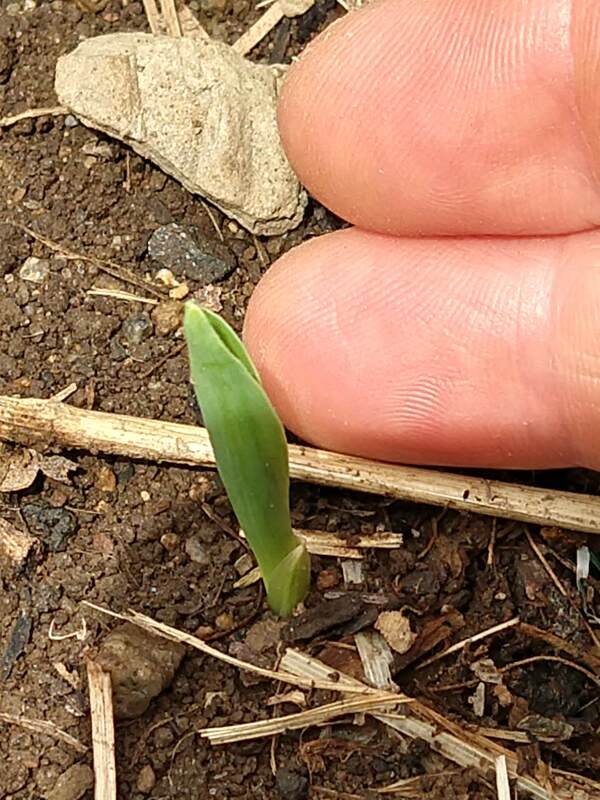 I have a pepper seedling with its first set of true leaves. I have never, ever gotten a pepper to go from seed to true leaves, so that is a personal best right there. 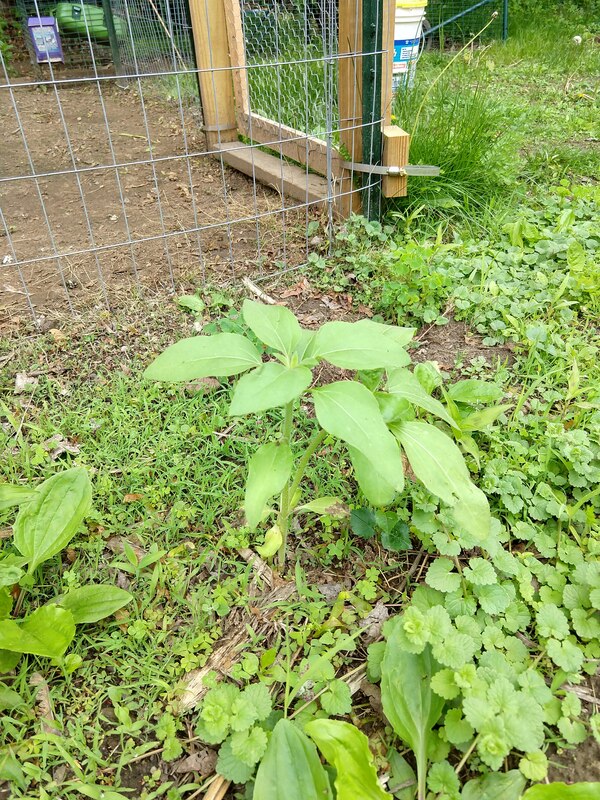 We also seem to be having a big year for volunteers, and by “volunteers”, I mean garden-type plants that we did not plant showing up randomly. Well, perhaps randomly is the wrong word. Last year, we had some sunflowers growing in a corner of the garden. Some of the dropped seeds did not get eaten by birds or chipmunks, so this year, we have sunflowers again, without even trying! 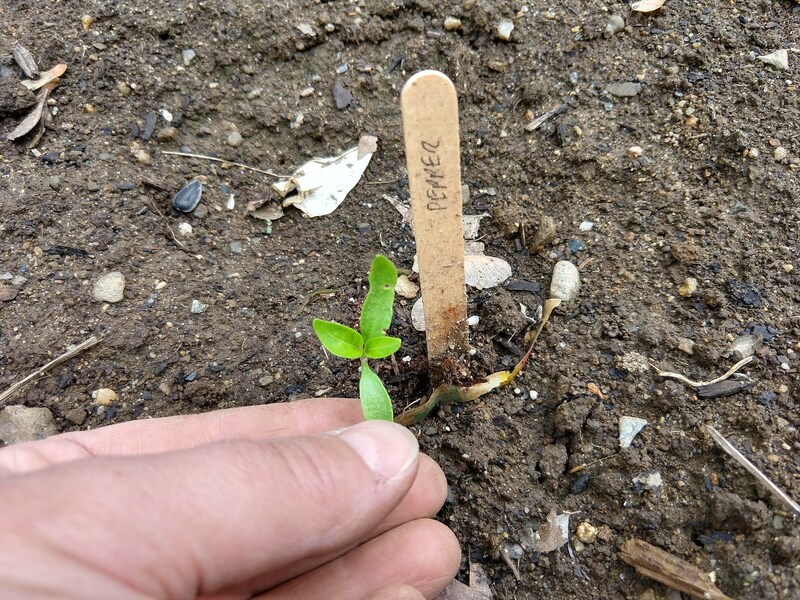 My biggest piece of advice to new gardeners is this- learn what your seedlings look like. Maybe you did not plant it, but you do not necessarily want to pull it. Not every volunteer was received so warmly, however. Check out the picture to the left. 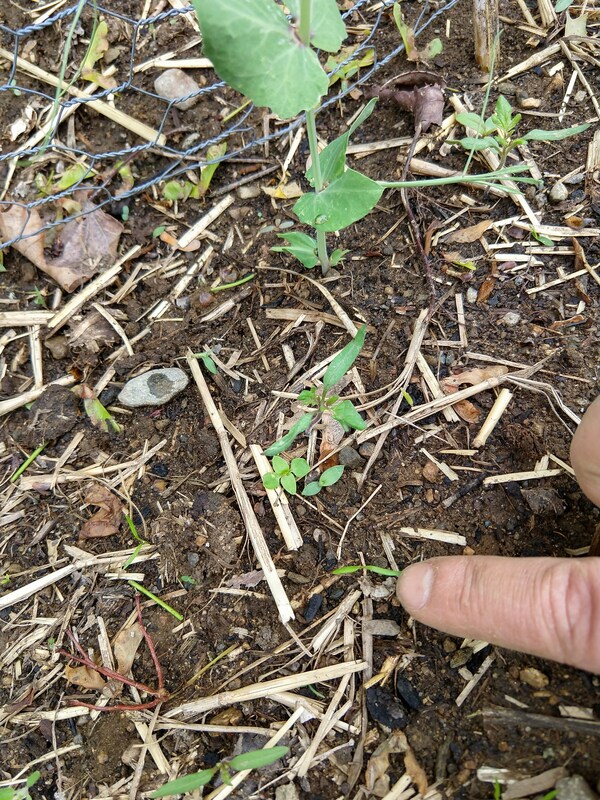 The big green thing is a sugar snap pea, happily growing right where I planted it. The teensie green wisp by my finger is a carrot sprout, also there by design. In-between, note the two random weeds and the tomato seedling. 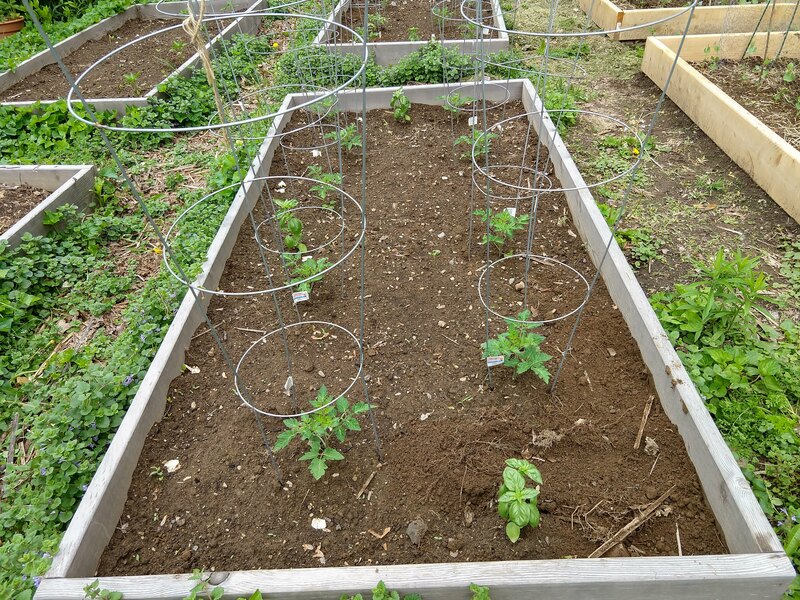 Yes, despite the serious cold snap that befell the eastern USofA this winter some tomato seeds managed to survive in my compost pile, then sprout quite vigorously once the compost was moved to the raised beds. 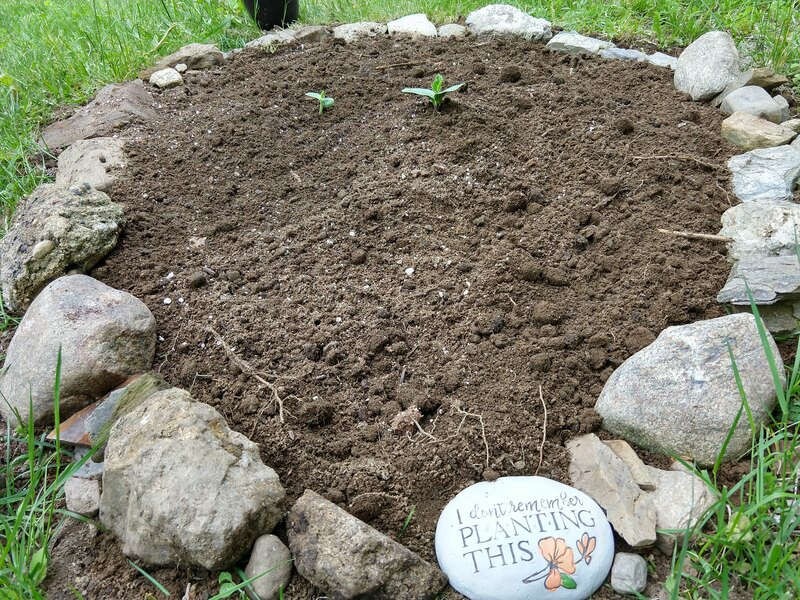 The hard part at this stage of the game, however, is to remove or re-locate the volunteer ‘maters without displacing the things I planted on purpose. Since most everything I planted is still in sprout form this meant some low speed hand plucking of the extra plants. Labor intensive? Yes. Tough on the knees and back? Yes. However, the only way to remove the tomato while preserving the carrot was with a very careful pinch. I repeated this procedure about a zillion times, sparing my little carrot sprouts, and my lettuce seedlings in the next raised bed. The irony, of course, is that I have very little success starting tomatoes from seed on purpose. That some rogue seeds would defy the odds and threaten to crowd out this year’s crops is both humorous and annoying. What to do with those, obviously, ultra-strong tomato plants? I struggled with that question. My instinct was to keep all of them and have an absurd number of tomato plants this year. Then I remembered that the last time I kept all the volunteer tomatoes I had issues with fungi and insects. I decided I would toss all the sprouts I plucked up today, but would consider options for growing in pots should more sprouts appear. It seemed like an adequate compromise. After all, I was very disciplined and did not overcrowd the tomatoes I planted on purpose. As Mr. Food It Yourself reminded me, having fewer, healthy plants is always better than having more, struggling plants. Mr. Food It Yourself is really smart. I did keep a couple of “mystery squash” sprouts. They could be pumpkins, zucchini, acorn squash, cucumbers, who knows. I had extra room in the dug-up part of my front yard, so I could not resist. 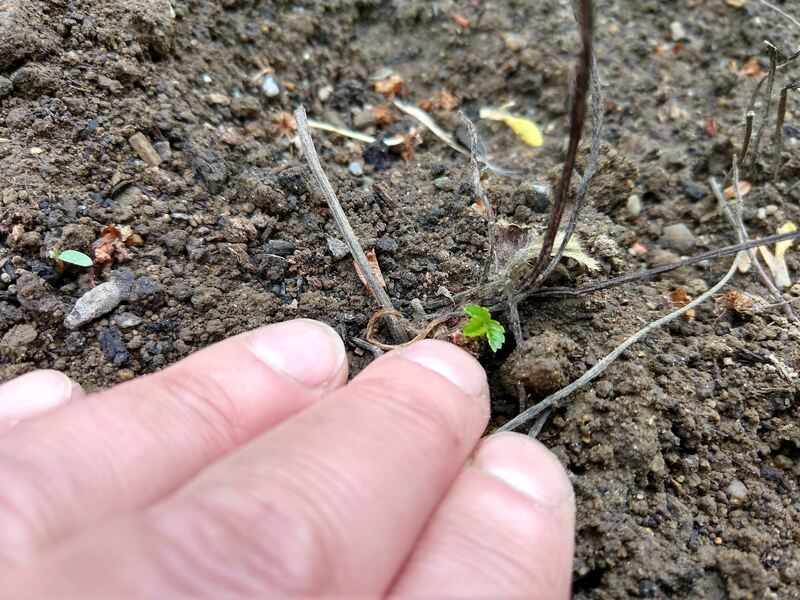 Gardening is always a learning experience and an exercise in probability. All the planning, digging, fertilizing, and watering cannot change the weather or prevent unexpected plants from planting themselves. What is the strangest, prettiest, or tastiest volunteer that ever popped in your garden? Share in the comments!